Just got off the phone with “Vermont This Week” host Stewart Ledbetter. Ledbetter suggested Zuckerman hadn’t told the truth in “Inside Track” last week when he said Democratic Senate Boss Peter Shumlin had on two ocassions suggested Democrats and Progressives have mended fences and Progressive Anthony Pollina might be a candidate the Ds could back in a race against incumbent Republican Gov. 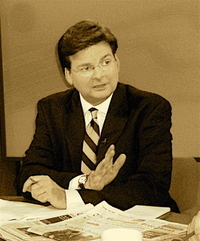 Jim Douglas in 2008. “[Zuckerman] can say what he wants to say,” said Ledbetter. “Shumlin said he was trying to be diplomatic about how the Democrats and Progressives could work together,” said Ledbetter. Shummy told him, he said, that he had been “very clear and careful” in talking to Zuckerman that he was not backing Anthony. Ledbetter said Shumlin also made other “off-the-record comments” to him which he did not share with yours truly. I'm a Democrat and not a fan of the Progs ... but I'll take Zuckerman's word over Shummy's any day of the week. These are the latest statements from both Zuckerman and Shumlin. Can someone please explain to me where either of them is lying? What I see is two politicians essentially agreeing but doing the political thing and not committing to anything. Where does Shumlin say he didn't talk about this with Zuckerman? He doesn't! Where does Zucklerman say Shumlin said he is 100% backing Pollina for Gov? He doesn't! Pay close attention to this statement by Shumlin, Shummy told him, he said, that he had been “very clear and careful” in talking to Zuckerman that he was not backing Anthony. That he WAS not backing Pollina. No mention of that he WOULDN'T back Pollina just that he isn't right now right here during this exact conversation. As far as I'm concerned just read between the political mumbo jumbo here and we can clearly see what's happening, NOTHING. No lies no stories just two politicians doing their politician thing. True. Probably much ado about relatively nothing. Sounds like Zuckerman may have overreacted a bit to Ledbetter's remark, though. But is this minor slapfight a story? But if Peter didn't have gossip to report, where would we all be? My only problem with Ledbetter's comment is that he singled one of them out. He did essentially call Zuckerman a liar. It would have been better to leave it as "to be determined later" kind of thing but instead he pointed the finger at Zuckerman. To me that is passing judgement and is not something a journalist should be doing. Journalists accuse politicians of lying all the time, usually indirectly, but sometimes directly. And as far as I can tell, sadly, they're usually right. Because that's what politicians do. They lie. When their mouths are moving, they're lying. Or at least "spinning." Apparently, that's their job. Of course, the journalists have their own agendas, too. Where does Ledbetter call Zuckerman a liar? He doesn't he simply states that the story may not be true, maybe Zuckerman is mistaken with what Shumlin meant? This is a non-story, that got blown out of proportion and then the out of proportion story got further blown out of proportion a second time. None of them ought to be upset. Not enough time in the day to have to explain the simpiliest of things to JPC. Oh come on give it a try, I am dying to hear the spin you put on this not issue, non-story. It is noteworthy that this entire discussion is about process rather than substantive issues. Obviously, it's important who runs and who doesn't, but we might better spend our time discussing how the potential candidates might actually govern. And as for Vermonter's assertion that "Journalists accuse politicians of lying all the time", I would argue just the opposite. Most reporters routinely accept almost anything they say rather than checking the facts. And finally, I wonder if Vermonter thinks anyone other than politicians might lie. How about executives from Enron, Arthur Anderson, Adelphia, World Com, Global Crossing, or the many Wall Street investment houses busted by Elliot Spitzer? Or perhaps tobacco company executives? Now there's a truthful bunch. And what about auto company executives who denied that many of their cars were death traps until Nader exposed them? And so on. If Vermonter is concerned about lying, where is the outrage about corporate malfeasance? And if you care so much, why not join me in insisting that all major media in Vermont adopt a regular practice (especially during campaigns) of examining important substantive statements by public officials and report when they are found to be inaccurate or misleading? Or does Vermonter just enjoy bitching? But we were talking about politicians, not corporate execs or anyone else. So why so defensive? Planning to run for office? But since you brought it up, do I think corporate execs lie? Of course. But I don't think it's their profession. By contrast, my view is that for politicians, lying IS their profession. Politicians choose a demographic that will get them elected, whether it's a conservative creep in the Bible Belt, or a socialist rabble-rouser in Vermont, and they pander to that demographic by telling them exactly what they want to hear, 24/7, whether it's true or not. To me that's lying. Actually, you were talking about lying politicians, not me. I was struck by your passionate statement that all politicians lie (presumably, all the time). This made me wonder about whether you were equally concerned about whether other important public officials lie to consumers and shareholders or if you are just fixated on politicians. I deal in facts and am troubled by how important decisions are often made on the basis of anecdotes and unexamined assumptions. And no, I have no desire or intention of running for office. Like you, I abhore the pandering in Americam politics. But in my opinion, your persistant complaints about Bernie are without merit. Bernie does not and has never pandered. That's what makes him so interesting and, more importantly, so appealing to Vermonters. They know he has always been honest and consistent. How rare. Furthermore, I challenge you to provide even one example of Bernie saying a) something he didn't believe (i.e., pandering); and 2) something demonstrably false. Note: The one thing that comes to mind was his position on gun control in his first successful election in `91. But I think he found a position that he could live with (support rural gun owners but also support bans on assault rifles). I have no idea what his true feelings are but if that's the only example I can think of for his quarter century in public office, that hardly qualifies as lying 24/7. As far as I can tell, Bernie never chose a demographic to get elected. He spoke his mind and the people of this state responded - in very substantial numbers. So if his advocacy on behalf of seniors, veterans, and average working people seems like pandering to you, then I guess we just disagree. And that's OK. But while I am deeply saddened by the reactionary politics of Jim Douglas, I see no need to call him names. Is it really necessary for you to characterize Bernie (who routinely gets almost 60% of the vote) in such derogatory terms? If you disagree with his positions on policy, address the issues. The rest is just petty. And BTW - if it's not the job of corporate executives to lie, why have hundreds of Fortune 500 firms been forced to restate their company's earnings reports? Finally, you didn't answer my question about whether you will support a regular media fact checking exercise. Don't you agree that we would all benefit from that? "Bernie does not and has never pandered." Please, you're killing me here. Bernie's monotonous bash-the-wealthy, us-against-them schtick is pure pandering, populist style. It's been done before, although Bernie's very good at it, I'll give you that. Bernie's appalling pandering to the gun nuts in the last few days of the election in 1990 just to get a seat in Congress was one of the worst episodes i can think of in recent Vermont politics. He was somewhat behind perfectly good liberal Republican Pete Smith in the polls in the last few days, so he accuses Smith of being in favor of gun control and brings all of the NRA and GOAL members out of the woods! Disgraceful. And, sure, I'd support a media fact checking exercise. You miss the point. A politician panders when he tells people what he thinks they want to hear in order to get votes. Bernie's analysis of the economy is by all accounts his genuine view of the situation and, moreover, is supported by the facts. It is people like you who characterize it as "bashing the wealthy". In fact, Bernie critiques a system, not individuals (and note that lots of wealthy people support Bernie). The use of this type of language has failed to deter Vermonters. Why not give it a rest. The question is, if his message had not resonated with voters, do you really think Bernie would change his tune? Since the answer is no, it cannot be pandering. Finally, I'm not sure why you characterize Bernie's populism (support for the common man) as a "style". Again, you assume he has adopted a persona with the sole intent of getting elected. It should be obvious from his consistentcy over three decades that it is not an act. Thanks. No, I do not miss the point. I understand your point. I disagree with it. I believe telling people what he thinks they want to hear is exactly what Bernie does. Just because he's been doing it for a long time does not prove anything. The tactic he used to first get elected tells me that fundamentally he's no different from any other politician -- he wants to hold elective office and he'll do whatever it takes to get it. You're entitled to like him if you want. That's fine. We can agree to disagree. How about during his campaign against Tarrant Bernie specifically stated he would support impeachment and look into intiating it. Of course it was hoopola since if he was elected he couldn't intiate it, nor could he if he lost. Either way after the election he clearly hasn't supported impeachment. Further, I consider deliberatly misportraying something as lying. Bernie's line about the rich get larger tax cuts is just that. Of couse they get larger tax cuts since alot of them are percentage based. Someone who makes 100 million and gets a 1% tax cut saves 1 million dollars, yet someone who makes 100K and gets a 10% tax cut saves 10K. Bernie knows this yet constantly uses it as fodder, playing on the peoples emotions. And Bernie has and will change his tune. Bernie drafted an agreement with George W. to bury nuclear waste in Texas by the Mexico border. Think he still supports that? No, now Bernie is greener then Al Gore. Those are a few examples off the top of my head, I'm sure I could think of more. BTW, I hardly think Douglas' could be considered reactionary. IMO it is almost exactly the opposite. Example, instead of jumping in with the global warming crowd he vetoed the bill. He usually takes a very unreactionary stance on things.